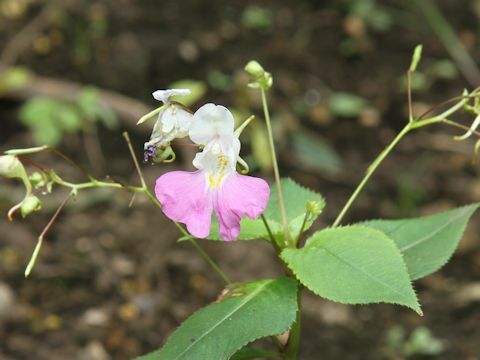 The Bulfour's touch-me-not (Impatiens balfourii) belongs to Balsaminaceae (the Balsam family). It is an annual herb that is native to the Himalayas, particularly Kashmir and surrounding areas. This herb grows in mountains of 1,500-1,800 m altitude, and it can reach about 50 cm in height. It was introduced into Japan as an ornamental plant, though it is naturalized now in many places. The leaves are ovate to ovate-elliptic, fine serrated and arranged in alternate. 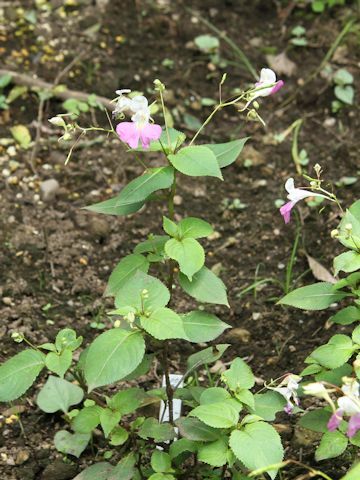 The white and pink flowers bloom in a raceme from July to September.